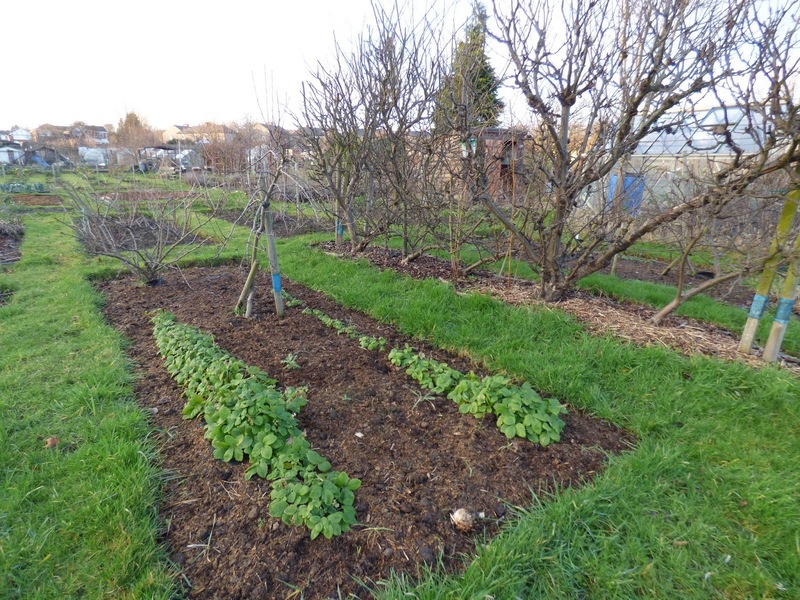 We have never gone in for sowing broad beans in autumn time as we have found a spring sowing generally works for us and we usually have plenty of broad beans stored in the freezer to mean that it is a vegetable that in one way or another we are rarely without. Last year we grew three varieties - Witkiem Manita, Masterpiece Long Greenpod and Crimson Flowered. 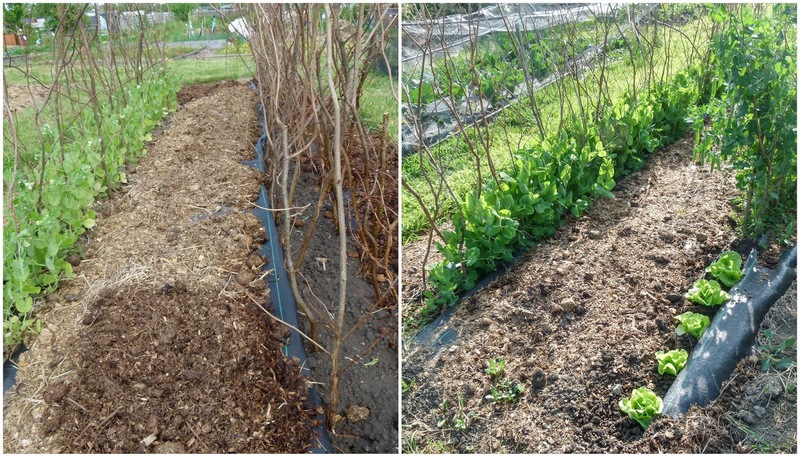 All the broad beans were planted in the same bed through weed control fabric. We didn't need to do any weeding at all. The harvesting table doesn't really fairly compare the harvests from each variety as we stopped picking the Masterpiece Longpod as by that stage we had a freezer full of beans and had plenty of other vegetables to harvest. You will notice that we didn't harvest any Crimson Flowered beans but this wasn't because they didn't produce any beans. 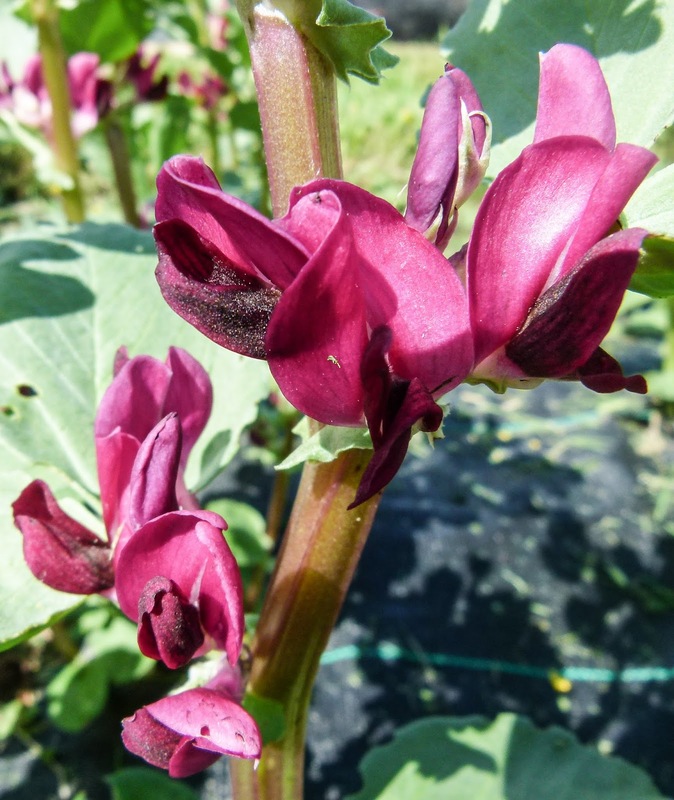 As I mentioned we had already harvested enough and to be honest, although we do usually harvest beans from the plants, we grow the crimson beans more as a novelty. The beans from these plants weren't wasted as we harvested them as seed for planting this year. 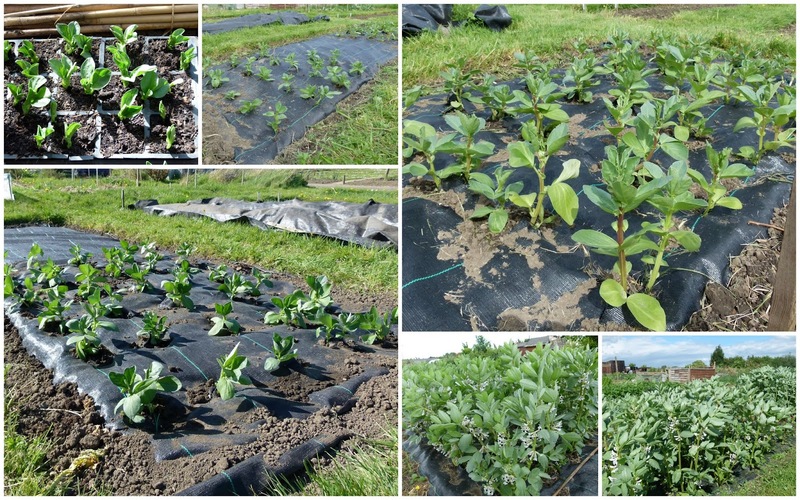 All in all, on our plot, we had a good year for broad beans and we will be growing the same varieties next year. Visited Tuesday - two days too late to be counted - Typical! 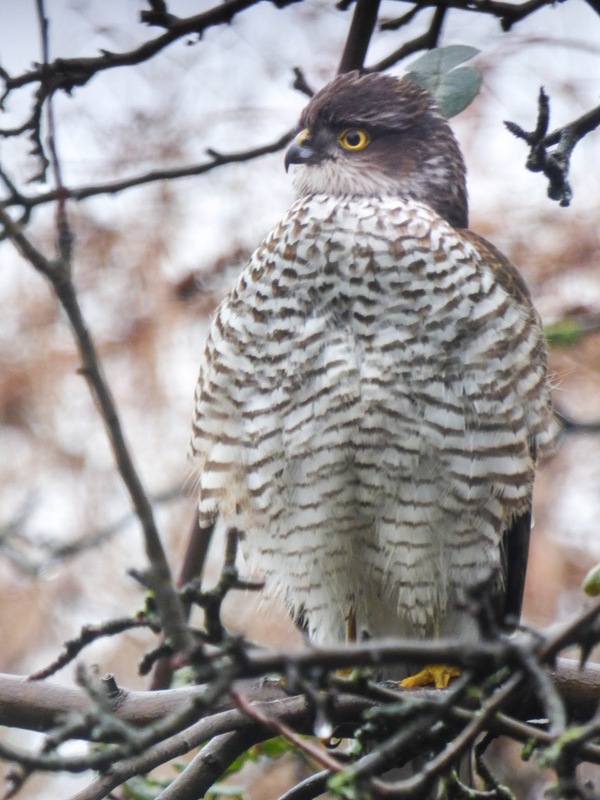 The following birds braved the wet weather to visit us during the Bird Watch. The numbers of house sparrows, starlings and goldfinches were down on the usual number of visitors but blackbird wars continued unabated. 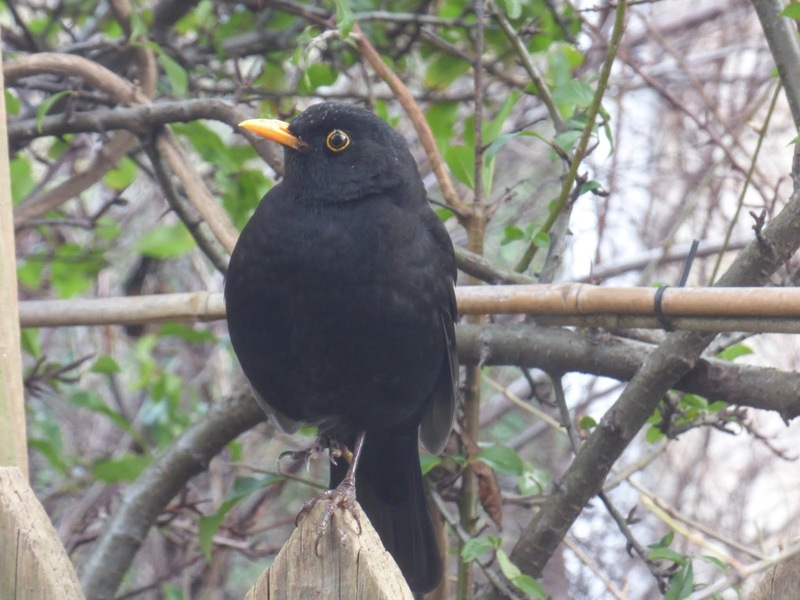 Most of the blackbird visitors were male and included our friend Hoppy. As you would expect our less frequent visitors stayed away. I tried submitting my numbers yesterday but the Birdwatch website was so slow presumably due to the numbers logging on which is a good sign. I'll try again today. Were our observations similar to yours? I do wonder whether bird visitor numbers fall during Bird Watch weekend as more people put out food in order to take part. This year I noticed that the RSPB even had an advert for the event on TV. 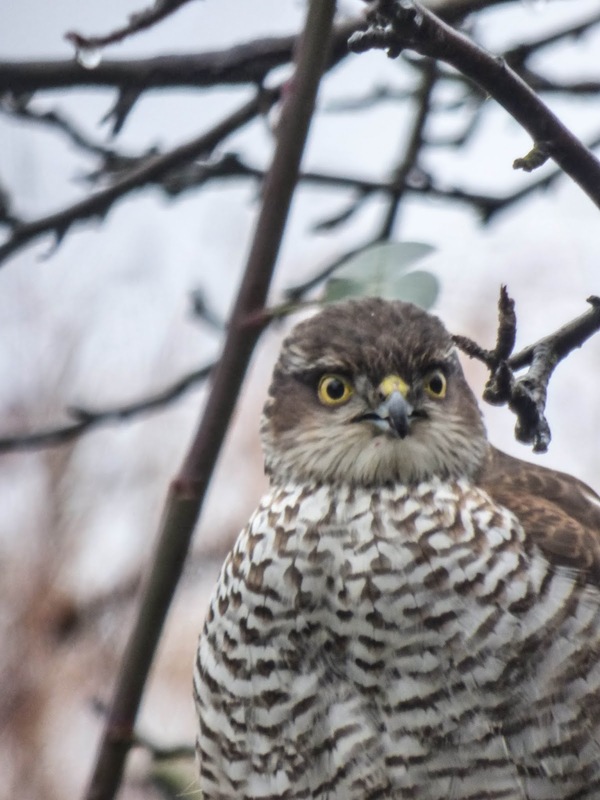 My theory is that our fickle feathered friends take advantage of the unexpected bounty knowing full well that their regular food supply will be there all the time. Not my favourite gardening task! 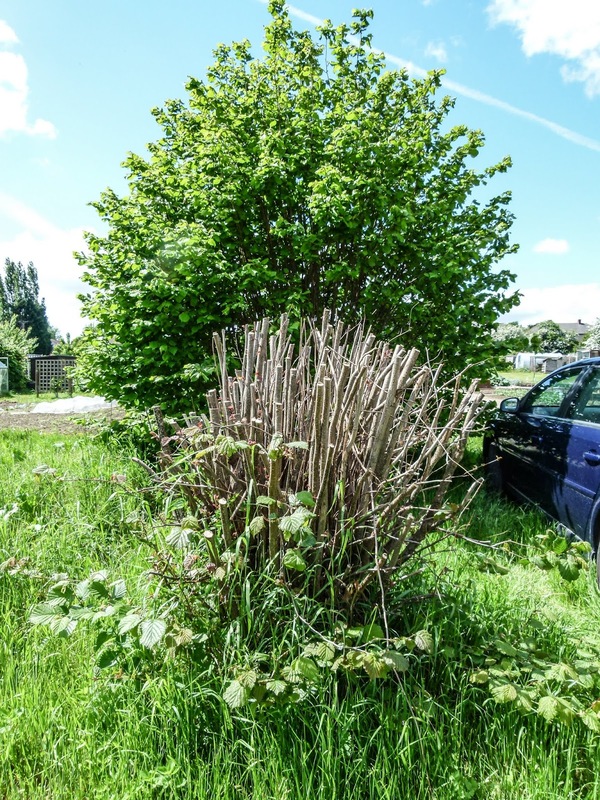 Regular readers will know that I was let off pruning our vicious blackberry this year as the bed it is growing it was subjected to a complete renovation. Unfortunately this hasn't spared me from scratches completely as I had to tackle another prickly customer - namely the tayberry. I usually leave this job until the leaves fall off. In November the leaves were still hanging on! 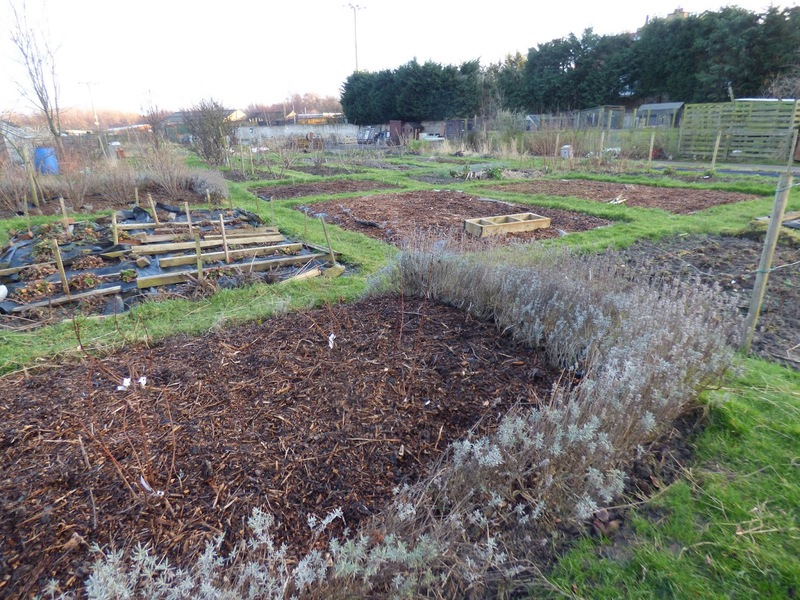 The leaves disappeared in December after which time it was a case of the time being right for me to tackle the beast. 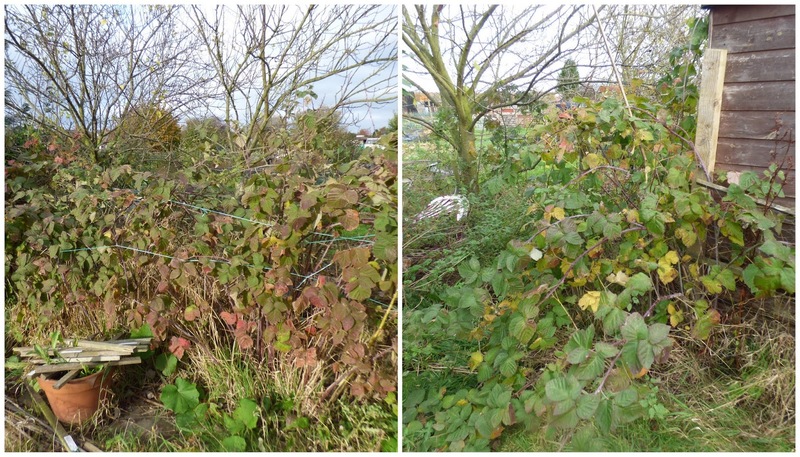 As you can see from the photo below the area around the base of the tayberry becomes very overgrown. It's not really pleasant pulling weeds out from between vicious thorny canes. Mid January the conditions for tackling the tayberry were right. Leaves had fallen and last Sunday was a reasonable day for carrying out a task that involved being in one place for a period of time. 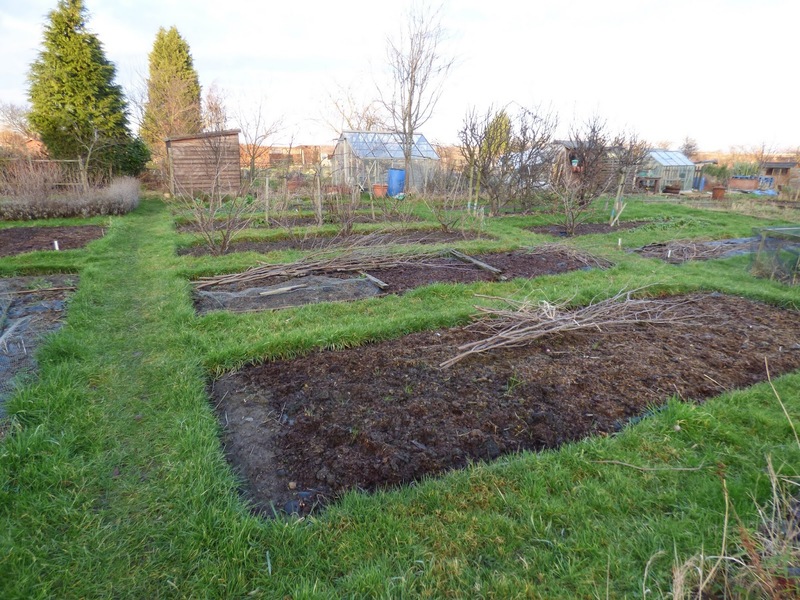 Martyn said he would cover one of the beds that was still free of weed control fabric whilst I sorted my tayberry. Note it becomes my tayberry when it needs pruning! I was faced with this. The tayberry is pruned in the same way as a blackberry. The first task is to put on gloves and make sure as much flesh as possible is covered. 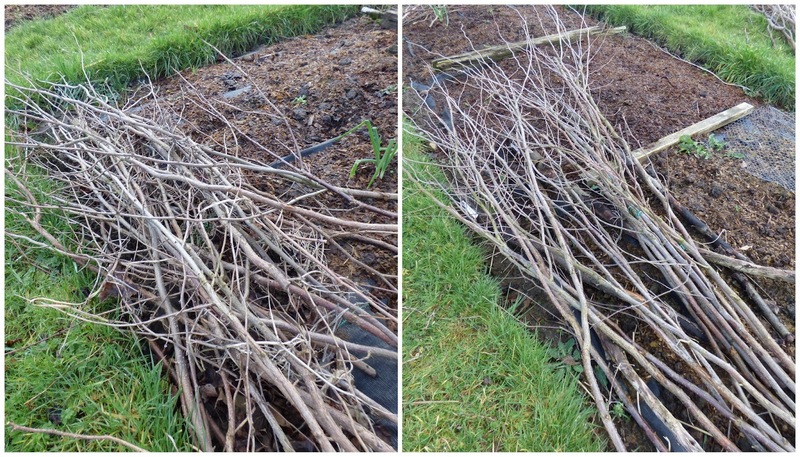 Once kitted out for battle, the first job is to remove any old canes that had fruited last year. 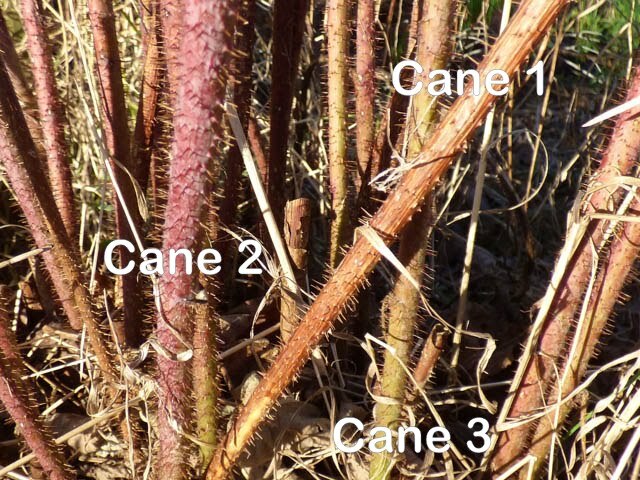 Identifying these isn't a problem as the old canes are brown (as shown in Cane 1 - below) rather than having a reddish (Cane 2) or green (Cane 3) tint. 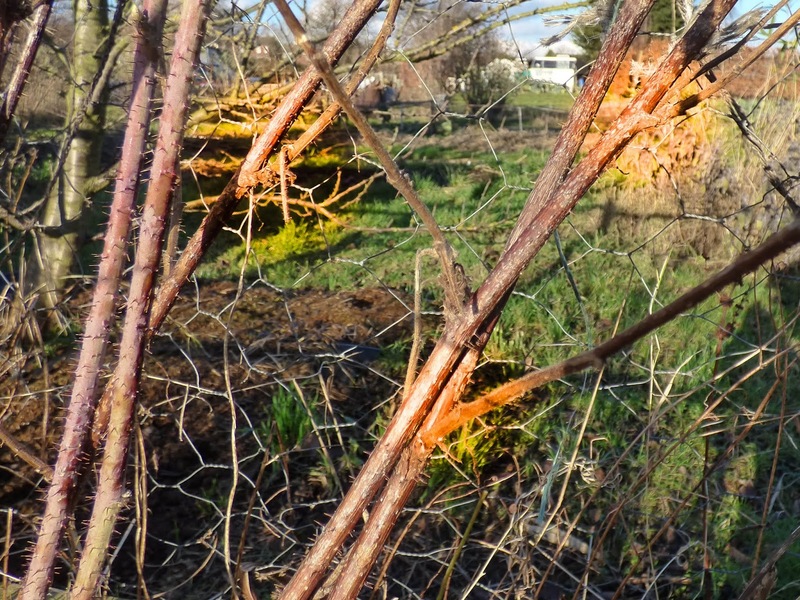 Old canes also have side branches (as shown highlighted below) where last year's fruit was produced, whereas the new cane are branchless not yet having produced the fruiting 'spurs'. 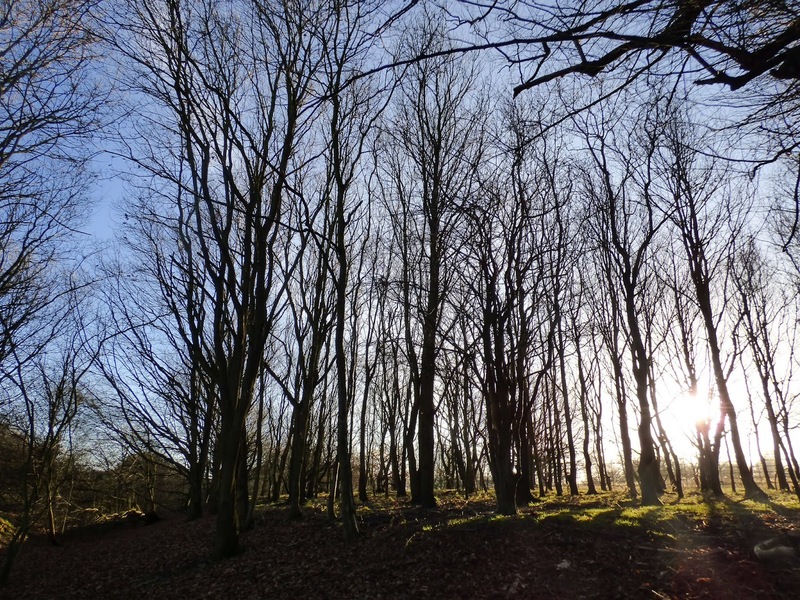 Once the old canes had been removed the remaining canes needed to be thinned out by first removing any thin spindly growth. More canes were then removed so that canes weren't too close together, crossing or rubbing up against a neighbour. 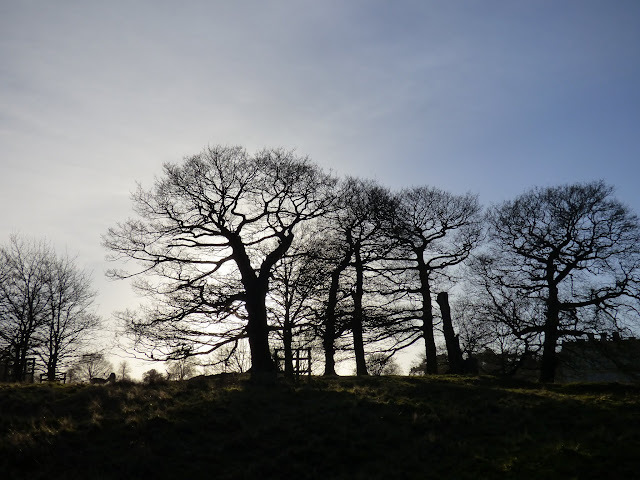 Actually I think I need to remove one of the canes shown below on the left of the clump. The remaining canes were then wrestled with and tied into position. I bent the top of the long canes over and tied them down to the wire. I didn't want any canes whipping around in the wind and making the most of the opportunity to scratch faces or other tender areas. Bringing the ends down is also supposed to encourage better fruiting and also keeps the berries within easy (if picking fruit from anything with such vicious thorns is ever easy) picking distance. Now we need to tidy up around the base on the clumps - more weed control fabric! 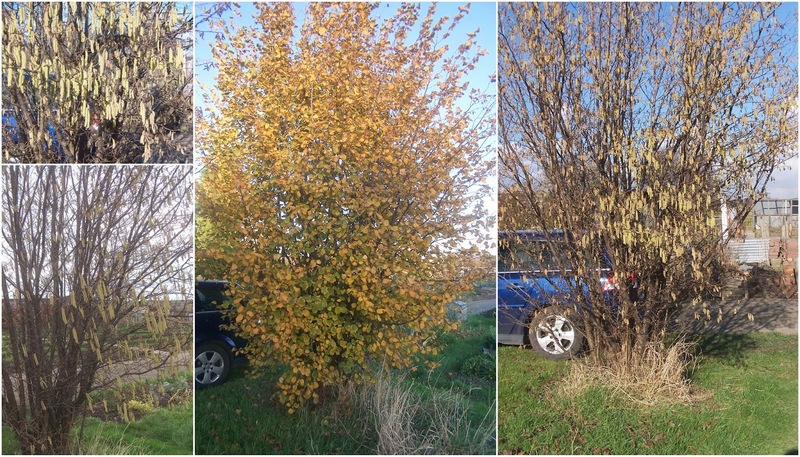 Years ago we planted a corkscrew hazel in our garden. We thought it would provide winter interest. It did - when the leaves dropped and the twisted branches were festooned with catkins - but for the rest of the year it was covered with an untidy mass of rather uninteresting leaves. In our garden it didn't give value and so it had to go. I can't remember how it came about, whether through shoots from roots or self seeded dropped nuts, but when we dug the original bush up we ended up with two straight stemmed plants. We decided that we would plant these on the edge of the plot. (Plants often find there way from the garden to the plot). They do look attractive at certain times and provide shade under which we can park the car during those hot and sunny summer months. Having more or less reverted to a wild form the bushes are very vigorous so they have to be treated severely. This does have a welcome spin-off as the hazels have started to provide us with a crop - not a crop hazel nuts. (Although a few wild nuts are produced and eaten by some opportunistic creature they are not really eating quality for humans). 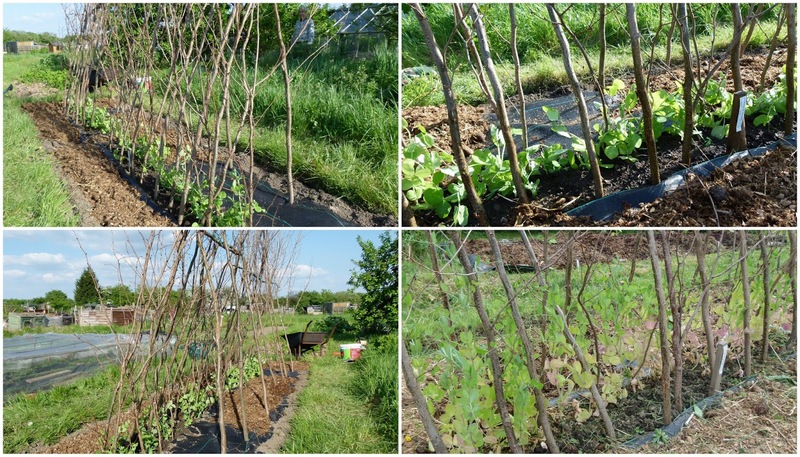 The crop provided is in the form of hazel branches which as I mentioned in previous post we use to create support structures for peas and sweet peas. Hazels produce very useful straight stems and hopefully weather better than bamboo canes. The bush, in the foreground below was cut back last year. As you can see from the photos below it has already made lots of new growth. It's the one on the right. The one on the left will be subjected to the chop this year - maybe after it has finished flowering as it would be a pity to miss out on the catkin display. 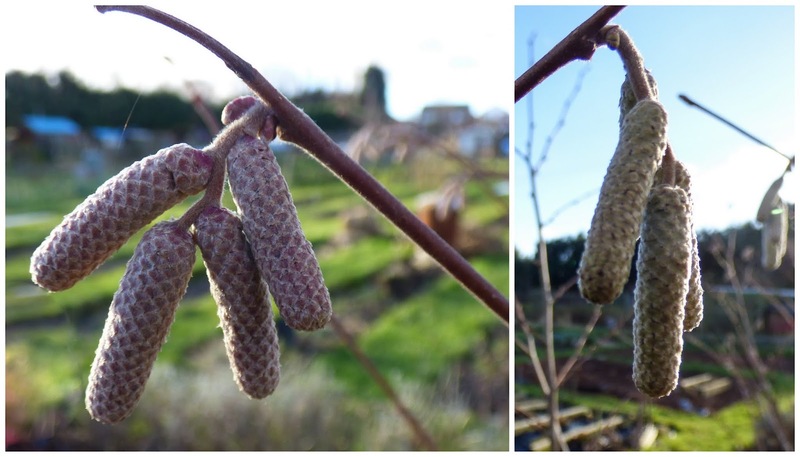 The catkins have been forming for a while now and as well as putting on an attractive display may help pollinate the cobnuts growing elsewhere on the plot. We have a pair of bushes that should produce edible cob nuts or as I have recently found out filberts. 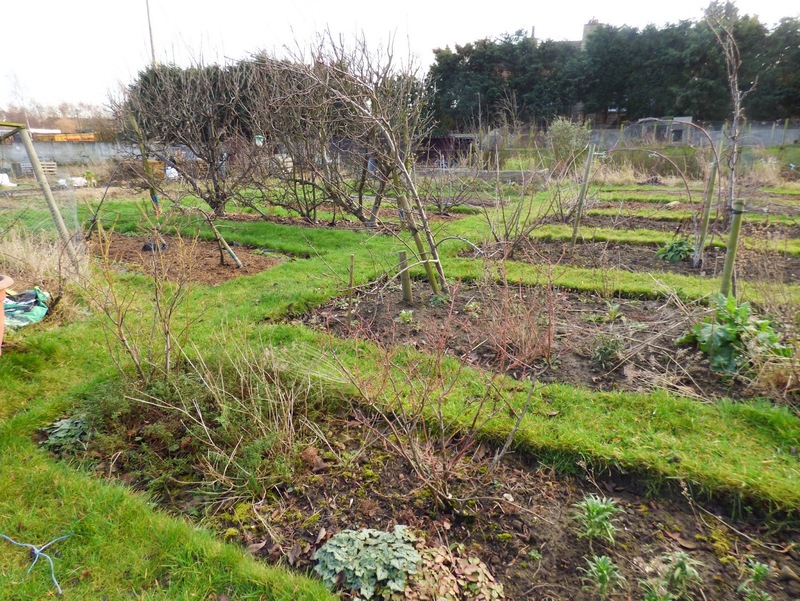 These bushes are planted in the same bed as the honeyberries - there still needs to be a little tidying of this bed around the nut bushes. Both bushes have already produced immature catkins - the male pollen bearing flowers. 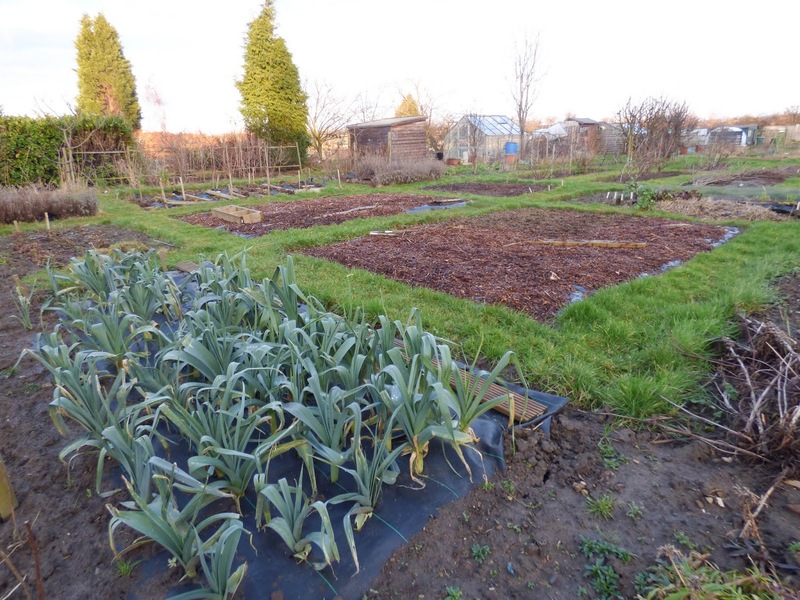 One of these bushes is a Kent Cob which came from Victoriana Nursery gardens in 2011. Apparently this is actually a filbert and should produce delicious nuts. It's friend is an unknown variety grown by our plot neighbour from a supermarket nut. This may not is unlikely to produce edible nuts but may help with pollination as I understand that our Kent Cob does better when cross- pollinated. Another advantage is that these plants are considered by the RHS to be excellent nectar plants which being early to flower will be good for the friendly insects. I'll be keeping a watchful eye for the appearance of the female flowers when I may give nature a little bit of help. It would be good to taste home produced nuts - that is if the local wildlife don't get to them first! Message for visitors to Martyn's blog. Sorry for the lack of posts this week - we are decorating and Martyn can't prepare his posts in advance. Normal service will be resumed soon. 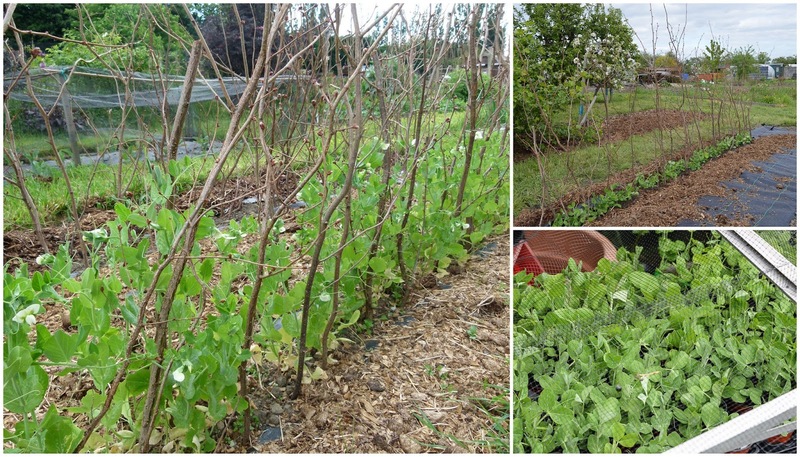 As with most crops we grew a mix of varieties of peas. We also stared off some of our seeds in pots in a cold greenhouse and others were sown directly on the plot. We have grown Carouby de Mausanne -a purple podded mangetout for a couple of years and it hasn't really done very well for us. 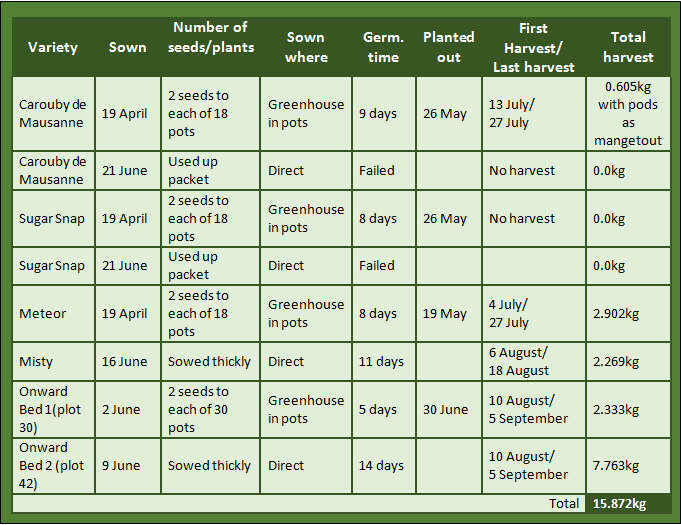 The seeds have been started off in pots in the cold greenhouse and when planted out are strong plants with good root systems but they seem to dislike being planted out and start to fade after planting on the plot. I tried direct sowing some more seeds alongside the weak looking plants but these didn't germinate at all. We did manage a small harvest. We are going to give it another year and this time will stick to direct sowing. The Sugar Snap variety was a total failure. It was grown alongside the Carouby plants but just about died when planted out. It was a variety that was substituted by the seed company to replace a tall growing variety of 'ordinary' pea so wasn't an appropriate substitute to start with. 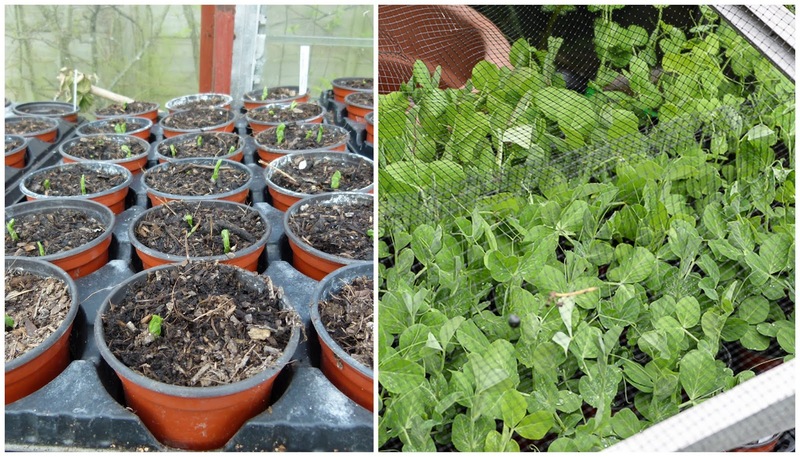 The next variety to be sown was an early pea - Meteor which was also started off in pots in the greenhouse before planting out. This fared much better. A second early variety - Misty was sown directly. The seeds were sown on a shallow trench. 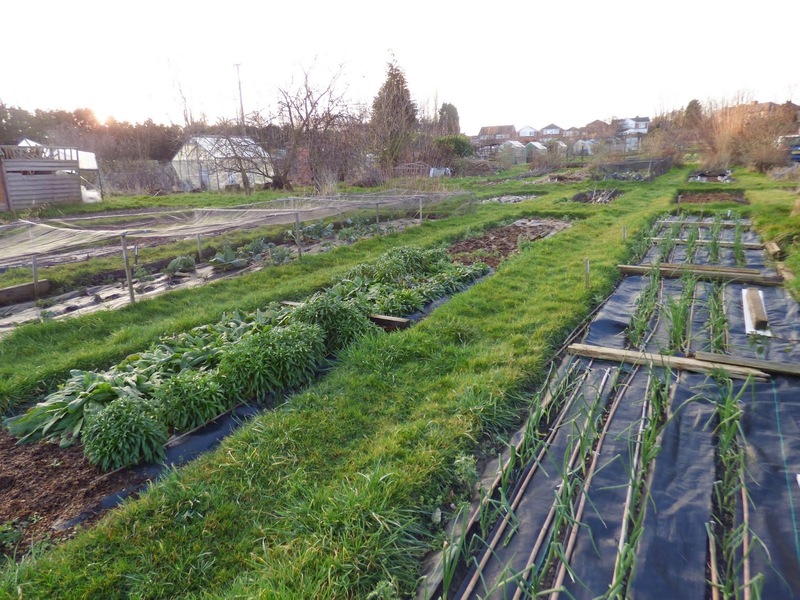 Three rows were planted a few centimetres apart as sowing thickly doesn't appear to be a disadvantage and allows for any seeds to be eaten or fail to germinate. We've grown Onward for some years and generally find it to be a reliable performer. We started some seeds in pots in the greenhouse and planted these out. These responded well to transplanting and produced a reasonable crop however it was the directly sown Onward that produced the bumper crop. We only really sowed these seeds to use up what was left in the packet. 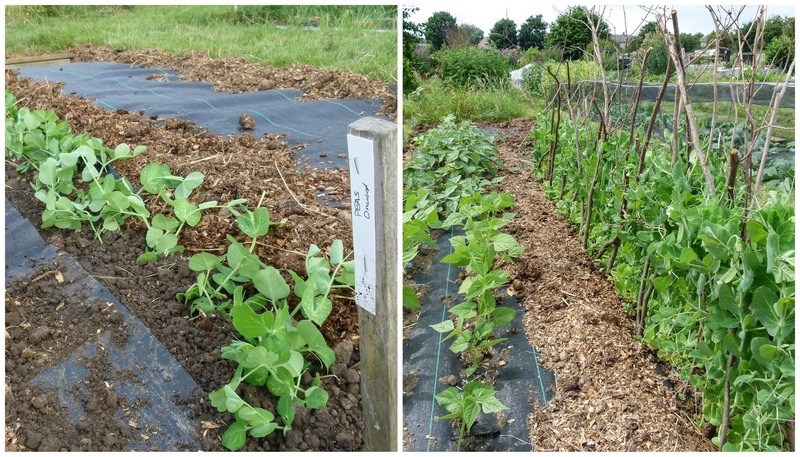 The onward are the peas on the right in the first photo and on the left in the second one. It's fairly difficult to come to any conclusions in the comparative performance of the peas but in the end we had a steady supply of fresh peas and also some to freeze. Ambassador - a new variety for us which is semi leafless and is supposed to have good tolerance to poor weather and disease. Carouby de Maussane - maybe its last chance to perform. Onward - we couldn't leave this out could we? It's the most popular pea for a reason. Markana - another new variety for us which is also semi leafless and supposed not to require support. From out of the window as I was pondering subject material for my blog, I noticed that things were beginning to happen in the garden. 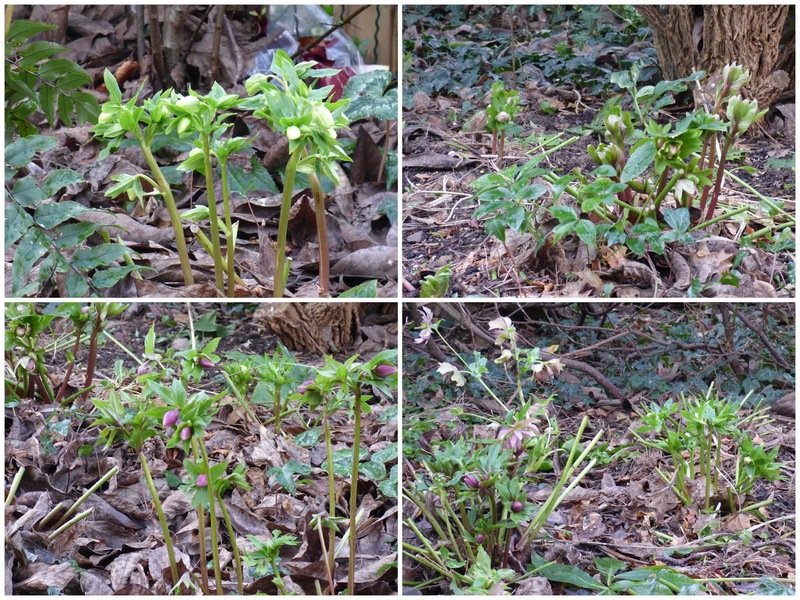 One of our hellebores has been producing flowers since November and was featured in a blog post at the time here. 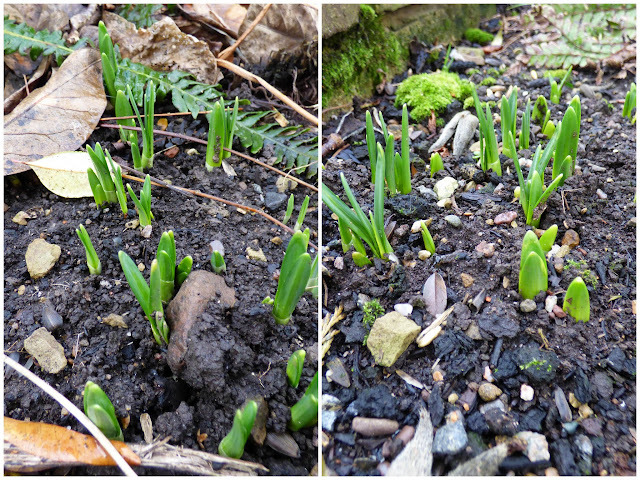 Now it's neighbours have decided to join in and are sporting flower buds. Buds are poking through the soil. The garrya is sporting long tassels. 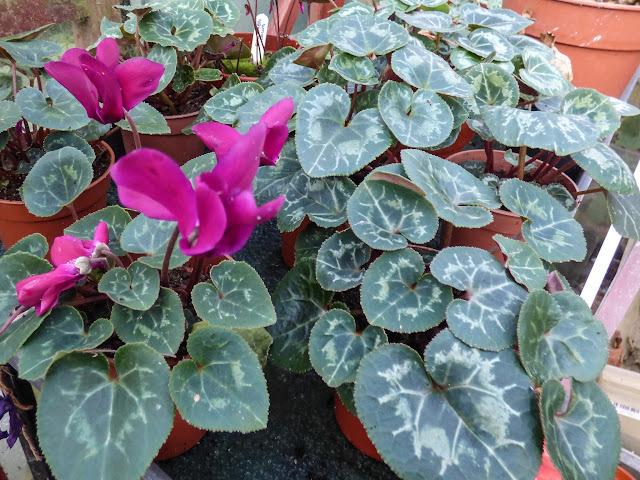 The cyclamen coum that I raised from seed a couple of years ago are flowering in the cold greenhouse. The large leaf next to it is from one of the cyclamen that I grew from seed collected from a plant growing as a pot plant in the house last year. I now have quite a collection of small cyclamen which are beginning to flower but as expected all are the same colour. Flushed with success at having raised cyclamen from seed, next year I am trying a variety called Cyclamen latinia Mixed F1 from Kings seeds. They are supposed to have a perfume and I'm assuming mixed means a mixture of colours although the catalogue only shows one colour. Surprisingly the ferns by the summerhouse still don't seem to realise that it is winter. I wonder whether our little friend Hoppy feels like it is heading into spring. Will his disability will prevent him from finding a mate? 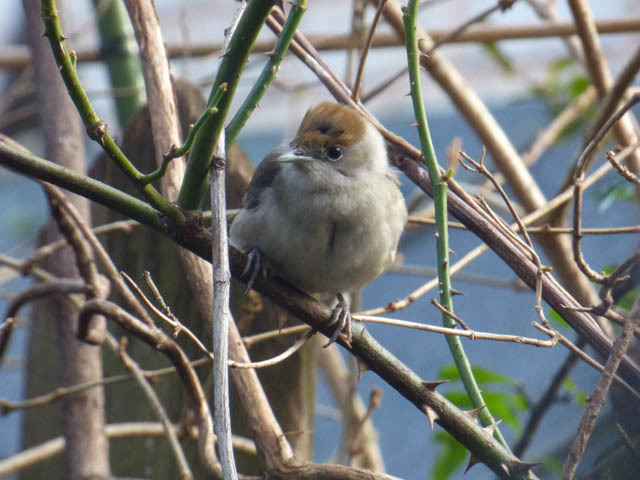 STOP PRESS - Visit Martyn's blog for a video clip of Mrs Blackcap - she was around again yesterday. 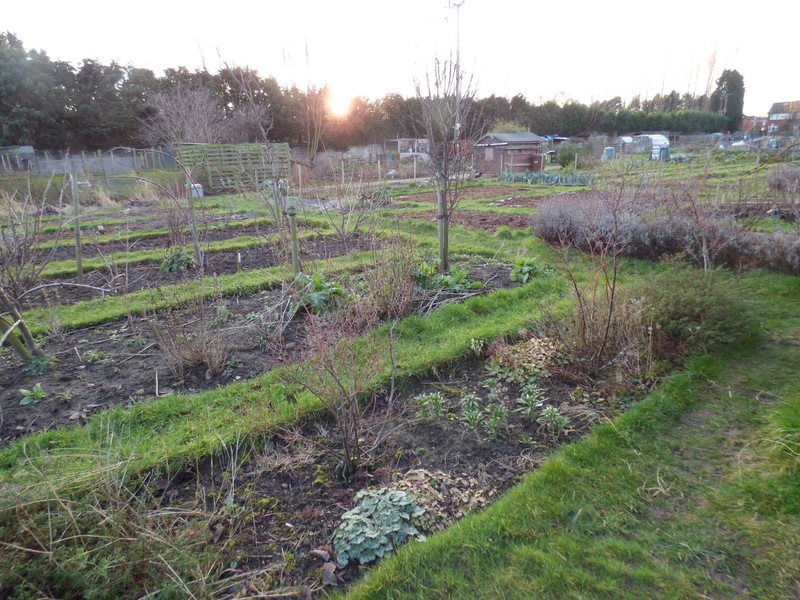 We may have turned a corner calendar wise and the daylight hours may be gradually increasing but I guess there are a few more corners to be turned before the garden escapes properly into spring. Just had to sneak in an unplanned post. A new (to our garden) bird visited our bird table today. 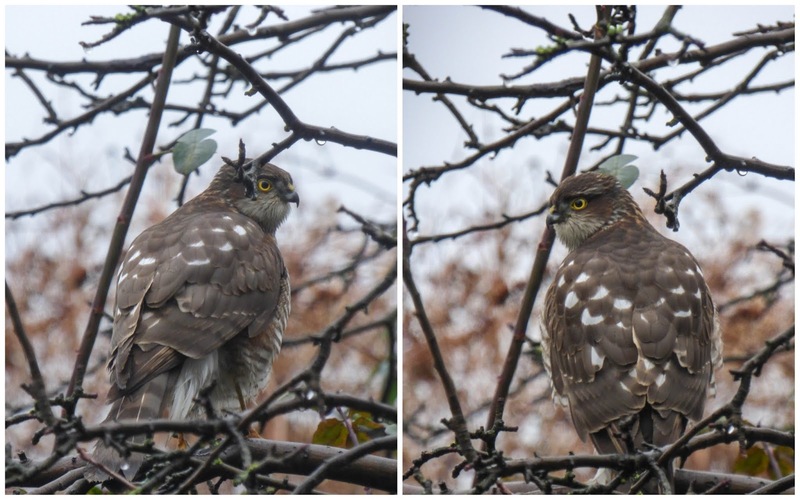 Really exciting - we've been sitting trying to get a good photo through the window. Leaded windows just don't help! Here's my best ( well in fact only) shot. 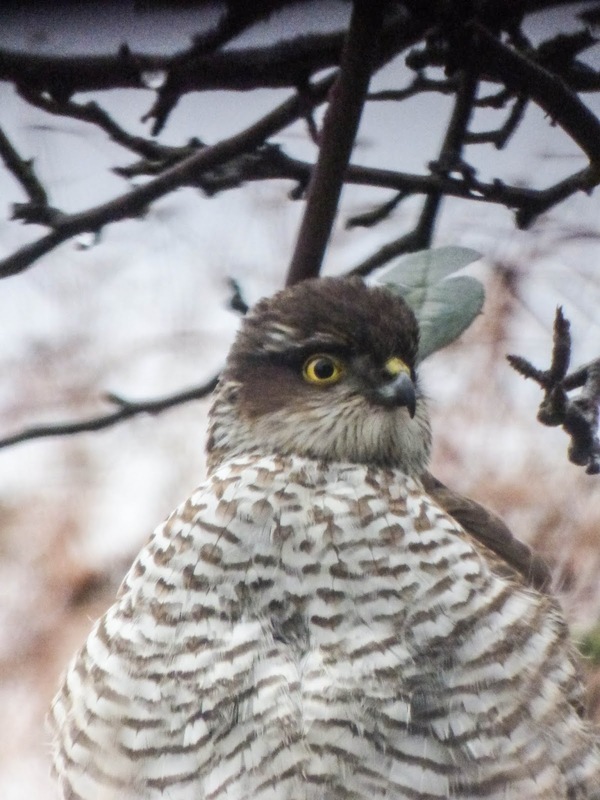 A record of the types of birds that we have spotted in the garden is kept on this page. This is our 26th species (33 if you count ones that we haven't managed to get a photo of and the swallows on the telephone wires outside of our bedroom window and that's not counting gulls and rooks etc that circle overhead) but I often wonder if we have missed anything by not looking out at the right time. 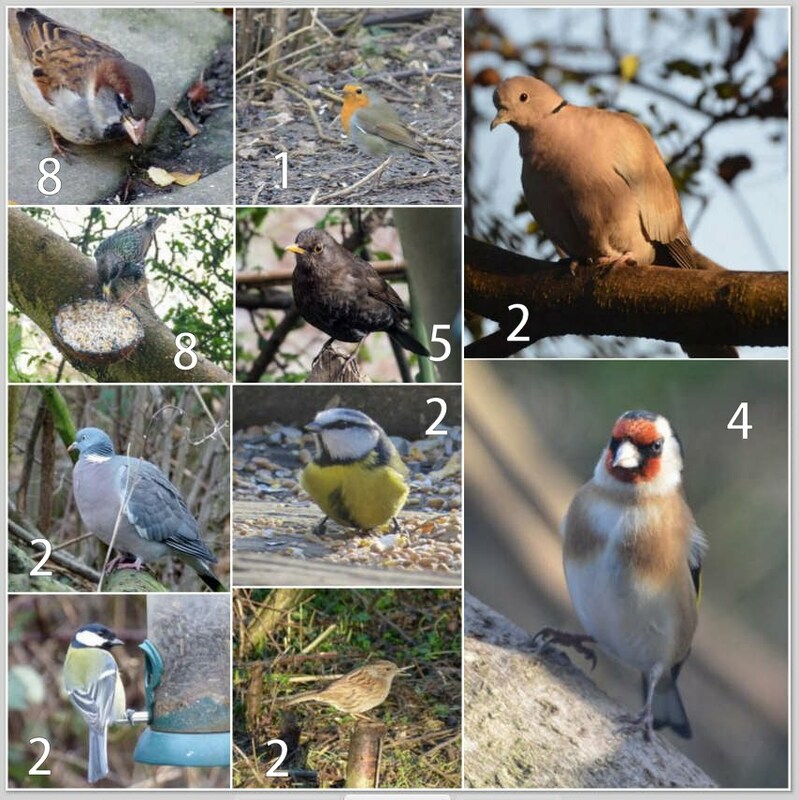 I bet everything will disappear for the RSPB Big Garden Birdwatch on 25 and 26 January. If you haven't registered to join in you can click here to do so. 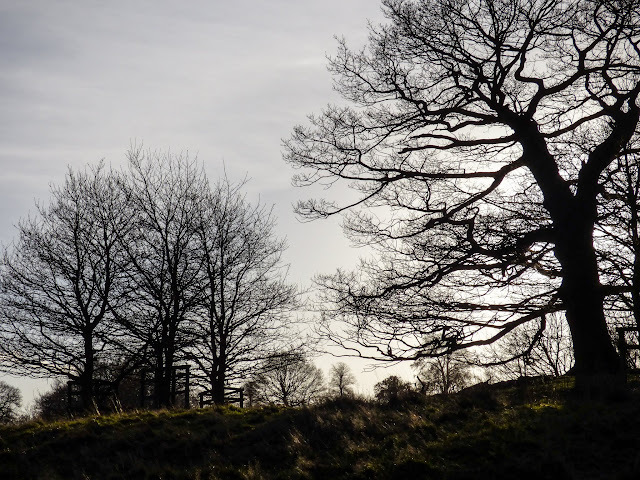 You'll get a £5 voucher to spend at an RSPB shop or online just for registering. 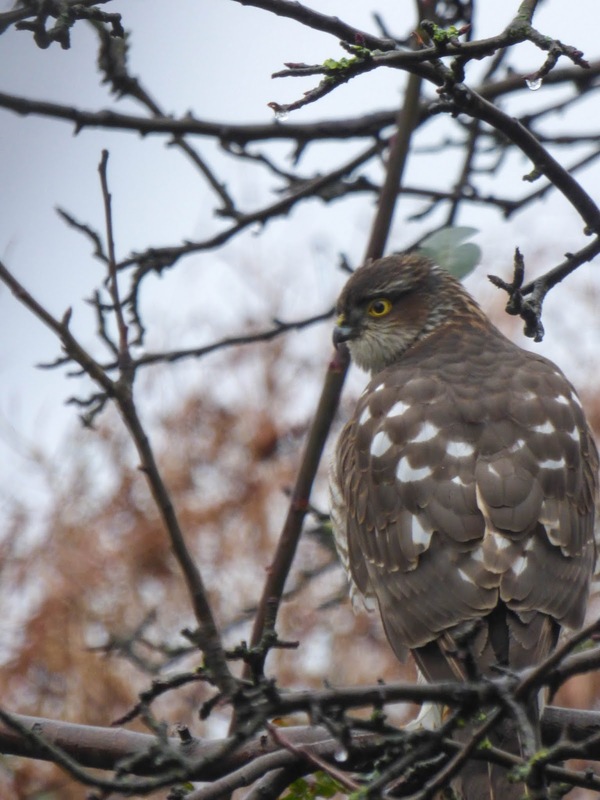 Where there's brass(icas) there are wood pigeons! Here's to this year being a good one!